Crossposting a thread from OCMB with text from a magazine leak first posted for download on WWP. I have a lot more to read, but this caught my attention. 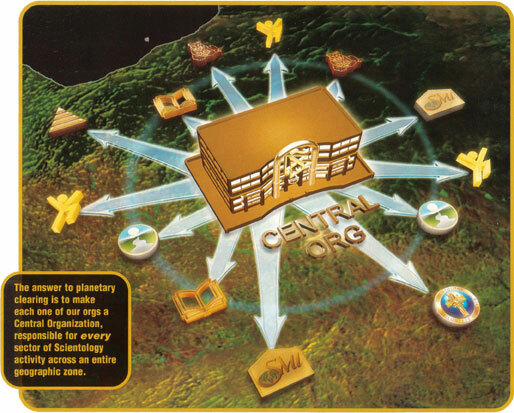 The answer to planetary clearing is to make each one of our orgs a Central Organization, responsible for every sector of Scientology activity across an entire geographic zone. I seem to remember this very thing being denied during the Sandy Springs rezoning meetings for the Atlanta Idle Org. At least, it seemed they were adamant that Narconon would not be run out of there. I think it depends on what you (they) mean by "run". I don't believe they will have the clients coming to the Ideal Org in SS for their "treatment", but I absolutely believe management and administrative decisions will be discussed and made by key people at the org. It is exactly as the caption says. I would imagine that the Sandy Springs people were not as concerned about the management decisions for Narconon and where they were made as they were about whether they would have addicts running around in their neighborhoods, so for that purpose, it may have been an accurate answer, otherwise known as an "acceptable truth".